The Honor 10 Lite's camera looks good because of the 'Night mode' feature. With this feature, you can capture vibrant shots and impressively do editing. Also, it is the first sub 15k handset that is powered by the in-house Kirin 710 chipset. The processor delivers 75% better speed and 130% boost in graphical performance, making your multitasking a fantastic go. The smartphone runs the latest EMUI 9 which is based on Android 9. The OS is very well optimized and comes with some innovative features. The Honor 10 Lite is launched in India on 15th January. It is the first phone to come with a 6.21-inch FHD+ Dewdrop display with a droplet-style notch in India. The smartphone is powered by an octa-core Kirin 710 that is coupled with ARM Mali-G51 MP4 GPU, 4/6 GB RAM and 64 GB default storage which is expandable up to 512GB. The Honor phone also gets a lot of AI support, which is especially seen with the cameras. The dual camera system includes a 13MP primary sensor with f/1.8 aperture and a 2-megapixel secondary camera. The cameras can recognize around 22 scenes and will automatically tweak the setting depending on what it recognizes. It also supports AIS (AI-based stability) and the camera app gets a dedicated Night mode as well. In terms of imaging, the device sports a dual camera system that includes a 13MP primary sensor with f/1.8 aperture and a 2-megapixel secondary camera. The cameras can recognize around 22 scenes and will automatically tweak the setting depending on what it recognizes. It also supports AIS (AI-based stability) and the camera app gets a dedicated Night mode as well. For selfies, the handset sports a 24MP Sony IMX 576 sensor and is also AI-backed with support for 8 scene recognition modes and AI Groupies. Connectivity aspects on board the Honor 10 Lite include sufficient network portals. It gets power from a non-removable Li-Ion 3400 mah battery and runs Android 9.0(Pie) out of the box. It is also the company's first phone with GPU Turbo 2.0. It has a fingerprint sensor which works faster. The phone is available in Blue, Red, and Black color variants. 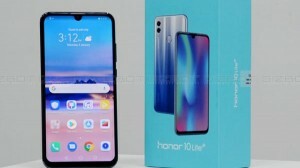 The Honor 10 Lite price starts from Rs. 13,999 for 4GB and 64GB variant and Rs. 17,999 for 6GB and 64GB variant in the Indian market.